If you, like me, are a bit of a map geek, you should carve out a half hour in the next two weeks and set coordinates for SPUR Urban Center in San Francisco. The urban-policy nonprofit’s Mission Street headquarters is an extremely welcoming space designed to facilitate public outreach, and it includes gallery space near the front entrance. 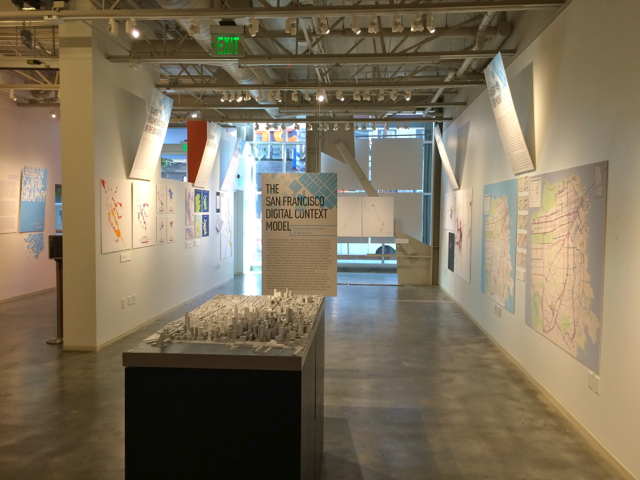 Through Feb. 6, that gallery space is devoted to “Urban Cartography,” an exhibit detailing the latest developments in map making, from technical innovations to artistic statements. Compelling if not comprehensive, the exhibition highlights creative efforts to organize and display the wealth of data available, and it emphasizes that what information is omitted is often more telling that what is included. There is wall space devoted to the evolution of Google Maps and the redesign of the San Francisco Municipal Transportation Agency’s system map. My favorite display, however, was Andreas Viglakis‘ maps showing the reach of public transit. Using gradients of blended colors, from blue to red, his work illustrates exactly how far 2 bucks, 12 bucks and everything in between will get you in the Bay Area versus other cities. Whereas New York and Los Angeles are essentially big blocks of blue, the San Francisco and San Jose maps show a lot more shades of purple. This entry was posted in Events, Urban Planning and tagged cartography, exhibition, maps, SPUR. Bookmark the permalink.